This page will help you to register an account and explain how groups work, the different roles that can be assigned and how they operate as well as how to join a class. There are also a set of potential scenarios that will help you to setup your group, if you are required to setup a group. Important note: If you need to create any groups, please do this before you join the class – this is because if you join the class before you sort out your group, you won’t be able to do this once you have joined the class. Depending on the requirements of your module, you may need to work in groups and be able to view each other’s blogs. Or you might be working in groups on a single blog and therefore need access to edit that blog. Setting up the correct roles for other members of your group may be tricky to understand, so you should visit this very useful Edublogs page that show exactly what each role will do. There’s also a very useful display showing the differences between roles and what you see in the Dashboard depending on the role assigned. To try and help explain the different roles and group types, there are a set of potential scenarios below that will help to provide instructions on how to set up different groups in Edublogs. You are in a group of 4 and you all need to be able to see each other’s blogs. 1. In order to do this, you should login to Edublogs and hover the mouse over ‘My Sites’ this will drop-down a list of your sites. Find the relevant site you need to share with the group and go to Users > All Users > Then click on ‘Add New’. 2. 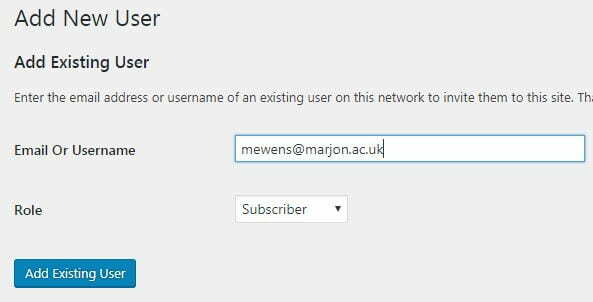 Type in your group member’s username or email address, for example 00000000@marjon.ac.uk > Then set the role to ‘Subscriber’ and click on ‘Add Existing User’. 3. If you visit the users area, you’ll now see the member of your group. Repeat the above steps to add all the other 3 members of your group to your blog. 4. Each of your group members’ blogs should appear in your My Sites area and when you visit the site, you’ll be able to see their site by hovering the mouse cursor over the house icon and clicking on ‘Visit Site’. You’ve been put into a group of 3 and you will only be working on one blog collectively. First, determine which person in the group will be used for the blog. Then, follow the instructions for scenario 1 (points 1 & 2) above to find the site and visit the Add Users section. 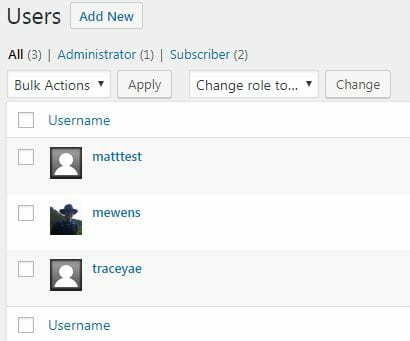 This time when you add each user, you must make their role ‘Editor’ – this means that each member of the group will be able to edit the blog pages and posts, so as a group you can all work collectively on the same blog. You’ve been put into a group of 5, working on one collective blog and the lecturer would also like every other student to be able to see each other’s collective group blog. Add all the other 4 members of your group as ‘Editors’ to the collective blog. It may be that groups have been pre-setup for you, so all you need to do in that case is login to Edublogs and find the site via My Sites and click on the site setup for your module, for example PYCC90. Check with your module leader or lecturer with regard to whether your groups have already been arranged. If you are working individually or in groups, but you shouldn’t see anyone else’s blog (apart from your group) – then as long as the class has been setup correctly, other people should not be able to see your blog. 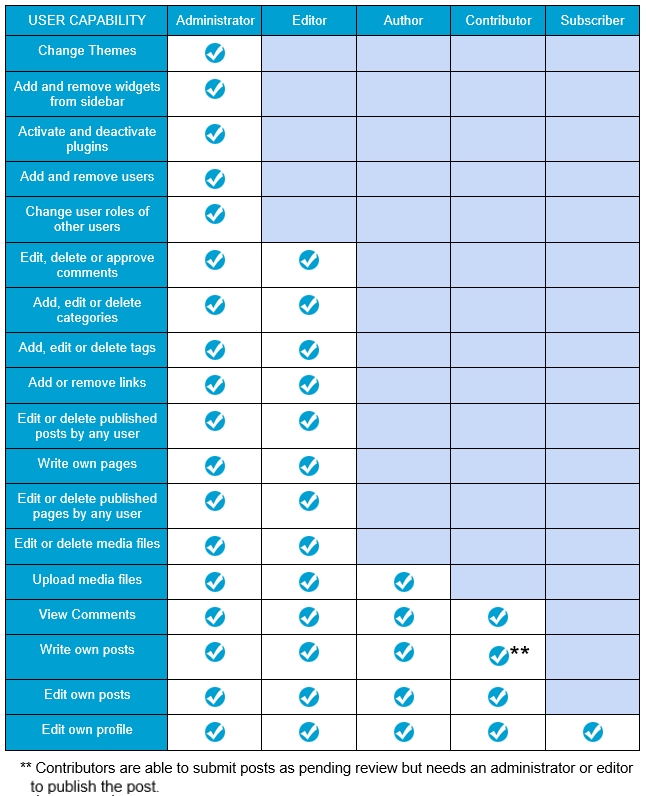 You may visit your Dashboard reader and see other people’s posts and think that you can see their blog, but this is only a snapshot of their most recent post and if you try to view it – it should not allow you to. If it does, speak to your lecturer or contact a member of the MeLT team. 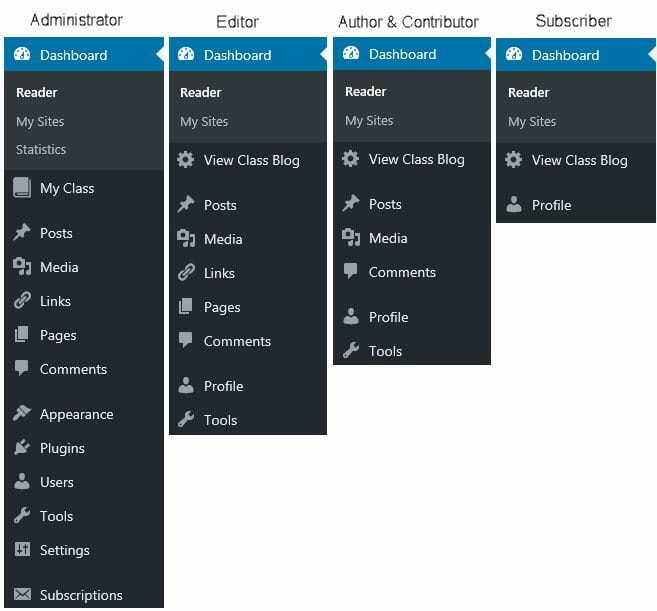 The purpose of joining the class is so that your module leader or lecturer will be able to view your blog and have the ability to add comments and mark it. Once your groups are ready, or if you don’t need to be in a group, you should hover your mouse cursor over ‘My Class’ and this will popup the option to ‘Join a Class’. 2. 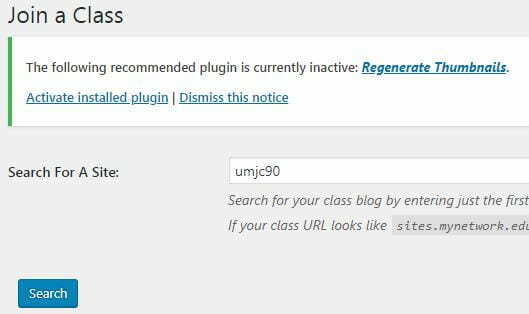 The class should appear below, with a link to ‘Send a request to join’ – click on the link and this will send a request to the lecturer, who will approve your blog.